The Dead Island (sometimes referred to as Carnivore Island or Carno Island or Hell Island) is a small island in the very north-east of The Island. 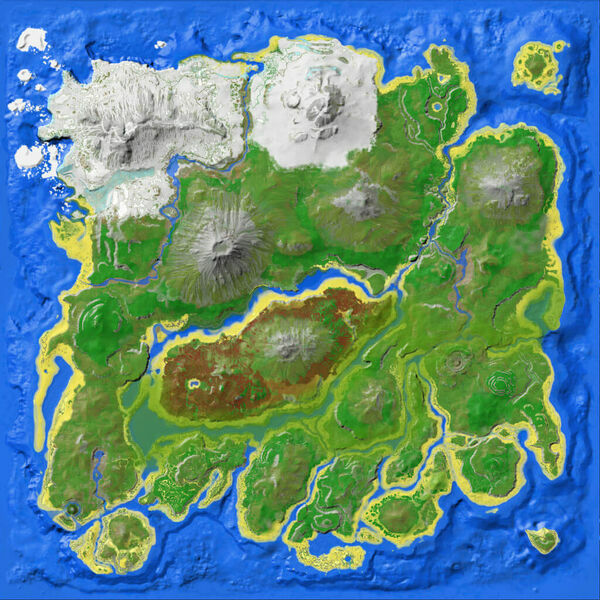 Dead Island is an island chain on the far north of the map, and one of the most dangerous above-ground regions in the game. Carnivores spawn here in mass numbers. While the Tyrannosaurs may be easy enough to notice ahead of time and avoid, the endless scorpions and sabertooths may get the jump on an unwary explorer. The island is predominantly sandy beach, with a small elevated rock outcrop in the center. Two outlying islands border it to the northeast and southeast. As a general rule, the Southeast and Southern edges of the Dead Island chain tend to be safer than the north side and interior. There are five beacon spawn locations on the island that are consistently blue-quality and above. The considerable distance between the island and the mainland means that accessing these treasures is best done by flying mount or raft. When making a base here, think about water mainly. Making a base atop a rock can be the safest option, but it requires an immense irrigation system that setting up alone is quite a dangerous task. Having water tanks would probably be the best option but they can be unreliable and empty quickly when faced with hiding from Rexes or other predators. Another option would be to live on the island where no creatures spawn, but moving over the water can slow you down making you a primary target for a hungry raptor or a shallows-dwelling megalodon. When making a Dead Island base, take all of these factors into mind. The most creatures spawn around the northern part of the main island. The beacon spots are located on the western part of the main island. The sea surrounding the island is filled with lots of Megalodons. This makes it dangerous to hunt Coelacanths, since those are common to find around the coast, but rather uncommon in the deeper sea. The small island on the Northeast side of Dead Island is overrun by Argentavis. On the small island on the Southeast side of Dead island, creatures don't spawn. On the northeast side of the island, the entrance of the North East Cave that contains the Artifact Of The Devourer can be found. Multiple tall rocks can be found in the island, most of which can be built on. This makes it ideal to start a base on one of these. With even a Pteranodon with increased stamina, survivors can carry 1 or 2 foundations back and forth between safe land and Dead Island to build a base atop one of these rocks, and then later use large fliers to bring back rewards from the island. There is a set of ruins on the northern side of the island. Having no herbivores on the island, which are known to provide easy EXP, Meat and Hide when hunted, living on the island is a continuous struggle for survival - if you choose it as your first settlement. It is therefore recommended to either group up with other players, or not to step foot on the island before you are able to build complete stone structures (level 20-25). You may be required to eat berries most of the time, since the most creatures often travel in packs among others, which makes hunting dangerously difficult at times for newer players. You can reach the island by swimming, if you have about 130 stamina, no weight penalty and the luck not to be ambushed by a Megalodon. Dead Island is a great place to level dinos and yourself, provided you have the correct equipment. When viewed from the mainland, the rocks on the island appear to resemble a shark. This page was last edited on 14 April 2019, at 16:30.